By the end of the year, you may well average out with a request for an extra cheque book altogether, from your bank. If you’re one of those hasty scribblers on an all-important document of your cheque book, here is alerting news for you. According to a new RBI notification to be effective from July 1, 2010, no cheque leafs marked with correction or alteration should be entertained by the banks, except in cases involving validation of the date purposes on the cheque. This new RBI directive would essentially imply that banks should not to accept cheques from their customers which entail overwriting for the purposes of validation of the changes in the payee’s name and any change in the amount – both numeric and words. Cheques with counter-sign validation of information by the customer, apart from the one involved in date validation, should be dishonored by the bank. In case of cancellation, the customer will have to issue a new cheque leaf altogether, in order to reduce chances of fraud. RBI further points out that currently, on an average, as many as 4.5 million cheques are processed by the clearing houses in the country. Hence, such a step involving safety and efficient working of the retail payment product functions is necessary. The notification also makes it mandatory for the banks to pre-print the customer’s account number on the cheque leafs, so as to avoid risks and misunderstandings involved with wring input of account number on the cheque leaf by the customer. The RBI has also prescribed certain benchmarks towards achieving standardization of cheques issued by banks across the country such as provision of mandatory minimum security measures on cheque forms and standardization of field placement on cheques. No alteration on Cheque leaf except for the date validation purposes. Pre-Print of Account number of the customer. Pantograph with hidden / embedded ‘COPY’ or ‘VOID’ feature shall be included in the cheques; to act as a deterrent against colour photocopy. Watermark with ‘CTS-INDIA’ logo on the cheque leaf with UV features; to make it difficult to photocopy or print an instrument. Field placement of a cheque to enable data capturing by Optical / Image Character Recognition engines and automation of payment processes. Do you feel that this change is for the good of people? Or will it increase the hassles, as the only form of validating mistakes would be issuing a new cheque leaf altogether? Get complete cheque standardization directive here. "You a Cheque Scribbler? 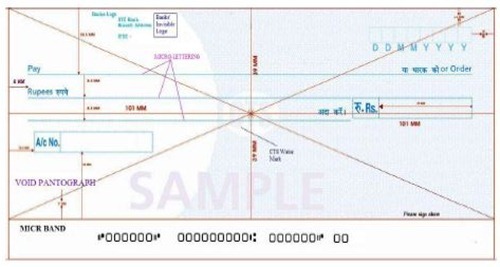 Beware, an Alteration on the Cheque Leaf can Cost you dearly! ", 5 out of 5 based on 1 ratings. i am running shop sstarted in dec2009 I had loss in business and took money from 4-5 financers and gave them cheques signed without date but now 5 days back my shop was on fire due to short circuit and lost everthing. now those financers are putting pressure on me to give our money or else they will take some steps which be not right for me. I am very much depressed regarding all this situatio, kindly please help me what should I do taking leagal steps in mind. Instead of spending so much time over inferior payment methods like cheques, RBI should do something to promote the use of net banking or NEFT. I recently had a bank-branch manager send me money by pay order(demand draft) even as NEFT facility was available at his bank-branch. If the people who are so closely associated with it refuse to upgrade their methods, how can we expect the lay man to use it? All that banks do is put up a vinyl flex that NEFT is available at that branch and its benefits. But nobody explains what it is exactly for. Heck! even the bank manager does not care for it. There is a vast difference between a crime and a mistake. Now the penalty (pls read its not a punishment) for the mistake of corrected cheque issue is slapping of cheque return charges. Even if one were to call it a punishment, a cheater will settle for a lesser punishment. Earlier cheaters used to issue cheques with out balance in their a/cs. With govt making cheque bounce a crime, the habit has come down. The above article opens up an interesting possibility. Suppose if some one want to cheat you by giving a cheque (again with out sufficient funds in a/c), all he has to do is make an intentional correction and countersign. The cheque before getting bounced becomes not valid. As the cheque did not bounce, the act is not a crime. So the person gets away with out punishment. I think people have to not only make sure you are issueing cheques with out corrections, also make sure doubly that the cheque you recieve are not corrected. From what I understand, if a cheque with alteration is issued, you could be slapped with cheque return charges which differs from bank to bank. So, it is not that an altered or corrected cheque goes unpunished (as you have pointed out above) when they get dishonoured by the banks, which please note. This will certainly help.. when we know and are sure that any edit except the date will not be entertained, we will be careful..